The Spektr-R space telescope is now a mere ghost of what it once was. Russia’s only space telescope recently stopped responding to commands issued from the ground, according to BBC. The details of the problem have not been made entirely clear and while the it isn’t possible to issue commands to the telescope it is still transmitting data. Launched in 2011, the telescope was originally only expected to continue working until 2014 but is has far outlived that expectation. Once slated for launch in 2004 or 2005, Spektr-R encountered “multiple delays” during construction. With it’s 33-foot radio antenna, Spektr-R works together with a network of telescopes on the ground to conduct research into the origins and structure of radio signals from within and beyond our galaxy. The telescope also contains instruments for observing solar wind and the Earth’s outer magnetosphere. With Spektr-R currently unable to take on new missions and a data transfer issue impacting Russia’s other science satellite, the Mikhailo Lomonosov, Russia has no active science satellites for the time being. 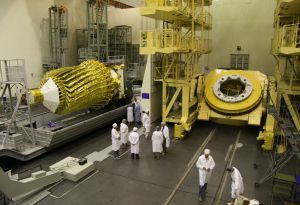 A Russian-German joint telescope project, Spektr-RG, was originally planned to launch in 2011 but is now expected to be put into service in March 2019. Until then, Roscosmos can only hope that its specialists are able to restore Spektr-R to good working order. The post Russia’s Only Space Telescope Has Stopped Responding to Commands appeared first on Futurism.